And who said that Damask & Dentelle was a tongue twister of a name? Try Saying "Mortimer Snodgrass" 5 times, fast, while holding your nose and jumping on one foot! All jokes aside, the content of this boutique is well worth the pronunciation exercise. I have been a long time fan of this abode. Office Christmas gift exchanges are always found here, my 2 girls rooms are adorned with their whimsical and amusing finds, and my office is filled to the brim with funny post it notes. 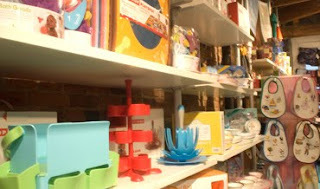 They have about every category of accessories you can think of: from jewelry to kitchen tools, pet toys and dishes to baby onesies, office supplies and stoop carpets. And on a beautiful sunny afternoon what better place than picturesque Old Montreal to discover this quirky and charming store. You'll thank me you did.